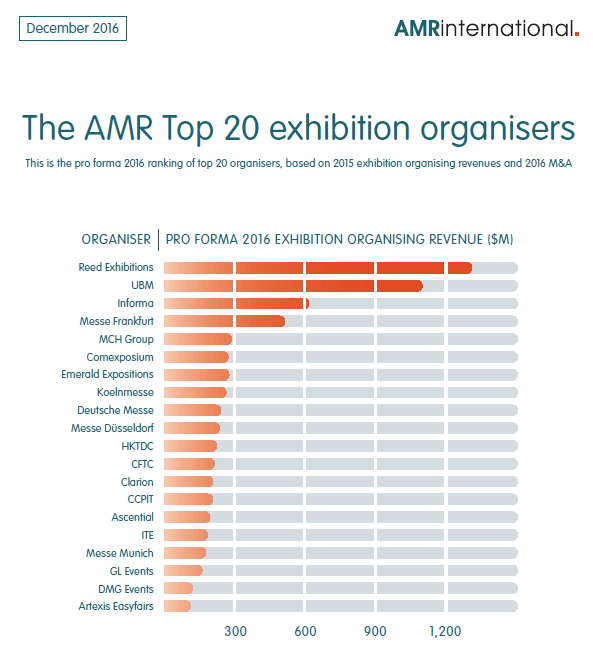 AMR International – the strategic partner that is guiding the transformation of the global events industry – has released its new “Top 20 exhibition organisers”, the only ranking by exhibition organising revenue. Known as the “AMR Top 20” and scheduled for release every six months, exhibition organisers can now easily see how they rank in the global events market. It also helps organisers to track any shifts in market share, particularly ahead of the financial reporting cycle. Organisers are ranked on the latest fully reported year combined with pro-forma revenues of acquisitions. The “AMR Top 20” confirms Reed Exhibitions as number one with revenues totalling just over $1.3bn. Ranking an increasingly close second is UBM, with almost $1.1bn in pro forma revenues, which have been expanded by its most recent acquisition of Allworld Exhibitions in Asia, following other acquisitions in the US such as Advanstar and BJI. Ranking third is Informa, it overtook Messe Frankfurt in 2016, following its busy year of acquisitions, most notably with its takeover of Penton Media, also in the US. Meanwhile, Artexis Easyfairs, enters the top 20 following its acquisition of Evenementenhal in the Netherlands.